John Leslie Green V.C. was the only Downing member to receive the Victoria Cross, awarded for ‘most conspicuous bravery’, during the First World War. He was killed in action on the first day of the Battle of the Somme and was one of only nine men awarded the Victoria Cross on that fateful day. John Leslie Green was born on 4 December 1888, the son of John and Flora Green of Birchdene, Houghton, near Huntingdon. He attended Felsted School before matriculating at Downing in 1907 to study towards a career in medicine, obtaining honours in Part I of the Natural Sciences Tripos (1910) before continuing his medical training at St. Bartholomew’s Hospital. 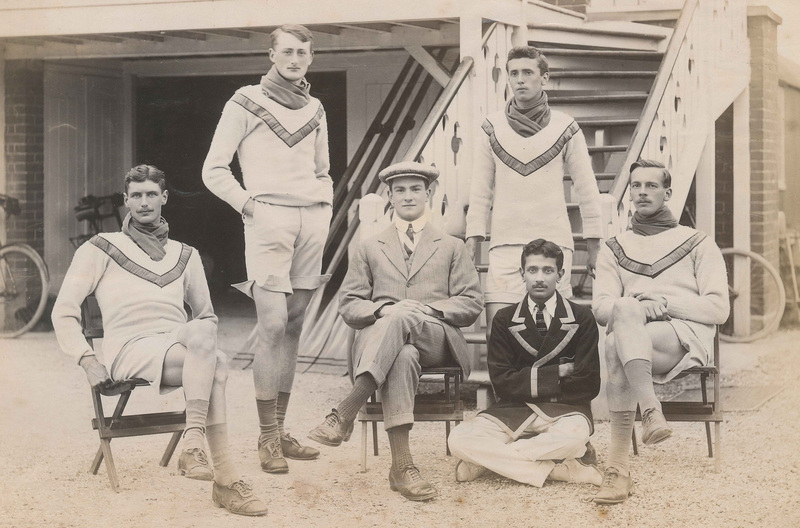 While at Downing, he was a keen member of the Boat Club, rowing in the Lents and Mays between 1908 and 1910. An album of early photographs in the archive, which has recently come to light, includes several images of Green. These photographs, of Downing’s Clinker Four in 1910, show him seated on the left and rowing at stroke. Capt. Green’s battalion, stationed at Fonquevilliers, took part in the attack on neighbouring Gommecourt which formed the northernmost part of the offensive now known as the Battle of the Somme, which began on 1 July 1916 and resulted in catastrophic losses for the British Army. Capt. Green was one of 19,240 British men who lost their lives on 1 July 1916, the worst losses in the history of the British Army. He is buried in the Foncquevilliers Military Cemetery (grave ref. III. D. 15). His Victoria Cross was given to his widow, Edith, and is now on display at the Army Medical Services Museum in Aldershot. After Capt. Green’s death, a memorial was erected in the High Street in Buckden by his father, near to the family home, ‘Coneygarth’, in memory of Capt. Green and his brother. On 1 July 2016, a representative of Downing College attended a commemorative service held in Buckden in memory of Capt. Green on the centenary of his death.